Clydesdale Harriers has had many very successful teams in the years since 1885 – the founding fathers won many championships and gold medals between them but the club had up to 1000 members to do it with, the post war teams with George White, Cyril O’Boyle, Pat Younger and company were the last to win medals at National level over the country, the Ian Donald, Allan Faulds, Phil Dolan and Doug Gemmell generation won a lot as well and the middle distance men of the 1990’s were quite outstanding with three of them winning GB vests. 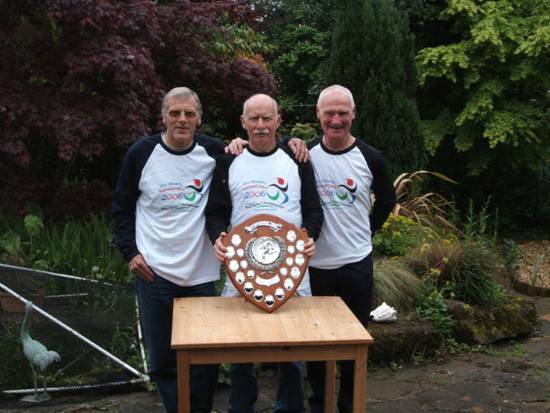 However possibly the most successful men’s team the club has ever had in terms of winning British titles is the group known as the Three Amigos who went everywhere as a team in the M60 Age Grouping and won just about every British Team Championship they entered, whether on the road or over the country, whether 5000 metres or 10000 metres, whether straight race or relay race between 2002 and 2008. In that period they won thirteen titles and medalled in four others – quite remarkable! Each was a very good athlete in his own right but if ever there was evidence of the total being greater than the sum of the parts, this was it. Before detailing their main triumphs, I’ll have a word about each of the runners separately and I’ll just do it in alphabetical order. Brian started out as a schools football player after attending a school in Lanarkshire where the heroes were Billy McNeill and Bobby Murdoch. By fifth year he was captain of the school first eleven and as was usual played for the school on the Saturday morning and for an amateur team in the afternoon, thereafter repairing to the pub or the dancing for a couple of pints. He had what he calls the ‘dubious pleasure’ of playing against Jimmy Johnstone when he played outside right for St Columba’s Boys Guild and Brian was left back for St John’s! Athletics became a career purely by chance. At the age of thirty six he had to give up weekly five a side football ‘due to several injuries – broken ankle, dislocated shoulder, broken fingers, fed up wife…’ By the age of forty he had gone up to 11.5 stones in weight and at New Year 1984 his resolution was to get back some fitness. 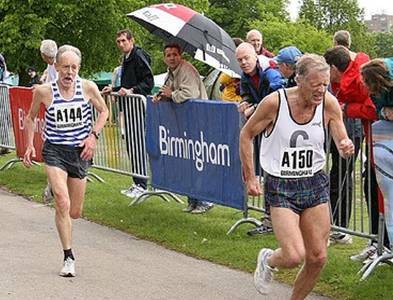 By January he had started easy runs with some other ‘potential geriatrics’. By April he was running in the Galloway Marathon in 3:26:00 and then three weeks later he ran the Motherwell Marathon in 3:22:00. In his first year he ran four marathons in all – not to be recommended he says! In 1985 he joined his local club Hamilton Harriers and as his children grew he introduced them to athletics taking three of them to the club twice a week and to League Meetings at the weekend. In 1986 he went to Inverclyde on a coaching course where he shared a room with one of his heroes, Commonwealth 10000 metres champion Lachie Stewart, and did some coaching at the club. !987/88 saw him try some triathlons with a bit of success winning the vets prize at East Kilbride and Cumbernauld. The training demands of three distinct schedules were ultimately too much physically and time-wise and so he went back to road running where he picked up various age group prizes at a variety of distances and venues. Brian had known Bobby Young and Pete Cartwright through road and cross country racing plus as members of the SVHC. It was actually at one of the Vets Races in 2003 that he got talking with Pete and the upshot was that he joined Clydesdale Harriers as there were no other over 60’s at his club to make up a team. Like the others Brian had many individual and team successes over the period in question – for example in 2006 he won both 1500 metres and 3000 metres at the Vets Indoor Championships in Kelvin Hall – but I won’t list them here because in this section we are dealing almost solely on the British dimension of their work. The team success thereafter is well documented and their raids south of the Border were so successful that they became known by the English as ‘The Border Raiders’. I believe that one of the main ingredients of the success of the trio is that they are indeed The Three Amigos who delight in each other’s company. Indeed at the start of this year (2009) they spent six weeks together in Australia and New Zealand: you don’t do that and not fall out if there is not something special in the relationship. He was very successful – two years later he won a round of the British Adidas Half Marathon series at Wilmslow in Cheshire followed by what he calls “a streak of title winning.” At 1500 he won the SVHC, the British Telecom National Championship and the British Civil Service Championships plus a bronze medal in the Vets Commonwealth Games in Grangemouth. 1994 was probably his most successful year taking gold in the WAVA Games in Canada, running for Great Britain and wins in America over 5 miles and 10 miles. His first individual title on home ground was when he took the 1500 and 3000 metres in the same day at Kelvin Hall. He then won the 5K Road Championship and was very pleasantly surprised when his club (Falkirk Victoria) presented him with their Athlete of the Year Award. Like everybody at the time he continued to race all over Scotland and he won his share of races but the standard of Masters Athletics was so high that hard fought races did not always end in success. The highest honour of his career was when he won the Athlete of the Year Award for Central Scotland in 1999. He raced and trained until he was 55 before he switched to Mountain Bike Racing. Having raced motor bikes as a sidecar passenger in the Isle of Man TT and World Championships for 15 years and gone into SuperKart racing, the thrills of using his fitness for the thrills of mountain bike racing was a big attraction. In his first two years he won the Scottish Masters Series title and became totally hooked on the speed, jumps, single track and adrenalin rush of downhill speed. Like all bikers however he had a big accident which damaged several discs in his back and he had to spend six months having treatment. He made his return with the intention of taking on the British Championships against the very best riders from the four home countries. He made it to second in the series and then in the Welsh Series he attempted an eight foot drop off and things went wrong: he ended up with a suspected broken neck! On X Ray he was told that he was lucky that he had only damaged the discs in his neck but that was enough for the doctor to tell him that any more disasters like that and there would be no more sport for Peter! So it was back to running. That’s when he joined Clydesdale Harriers, teamed up with Bobby Young and subsequently Brian Campbell with the avowed aim of trying to bring some British titles in the M60 age group back to Scotland. They trained hard – individually and as a group – travelled a lot and had a great time winning titles and just being together. The running led to the thirteen titles, the friendship led to a six week holiday in Australia and New Zealand in 2009. Bobby leading the M60’s in Scottish colours. Bobby took up running for the first time in December 1979 when he was thirty six with some friends and work colleagues. A five mile run at 9:00 am in Pollock Park on Saturdays turned into a twice yearly handicap race and Dinner. 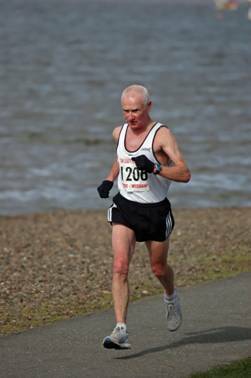 He had a go at several races including the Springburn Cup, Round Cumbrae and the Glasgow University Race over the next two years before there was a group decision to run in the second London Marathon and the first Glasgow Marathon – both in 1982. These resulted in times of 3:03 and 2:46 after which training became more regular. He got up to 60/70 miles a week with a couple of speed sessions and the regular long Sunday run became standard practice. 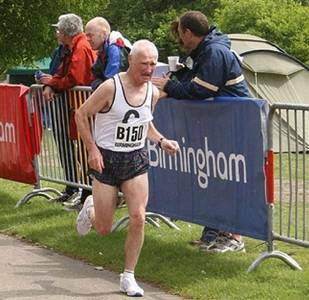 Bobby joined Clydesdale Harriers and ran a couple of dozen marathons and recorded 2:37:18 in Glasgow in 1986. 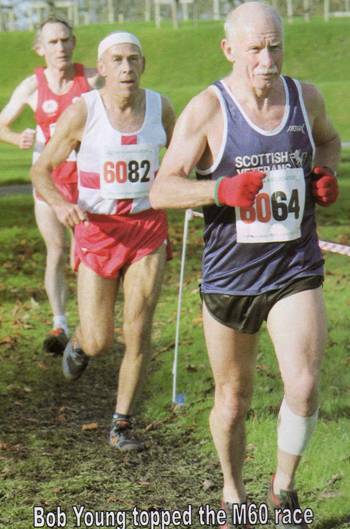 His lifetime best for the marathon came at Lochaber in 1990 when at the age of 46 he ran 2:36:15. He regularly ran 10K’s in 33 minutes, 5K’s in 16 minutes, 10 miles in 54 minutes and half marathons in 72 minutes testified to the quality of his running at this point. In 1988 he took part in the first ever British Veterans International at Wrexham where he won the bronze at M45 – Pete Cartwright had also been invited. 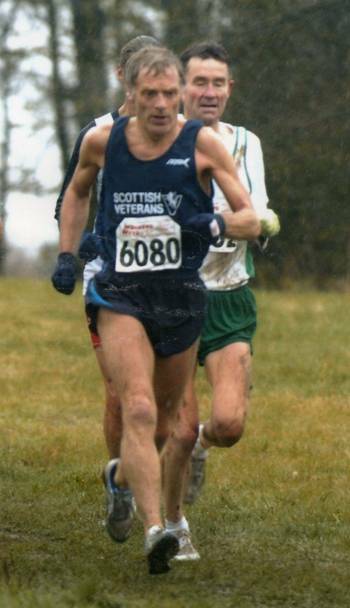 Bobby then ran in the British Vets International for 18 consecutive years until 2005 when he won gold in the M60 category. And that is one of Bobby’s biggest virtues as an athlete – he is very competitive and goes looking for good competition. The table below shows his record in Scottish Championships is summarised in the first 10 rows and successes further afield follow. And you can add in 4 SAF Gold Medals and 4 SAF Silver medals that are unlabelled in any way! As for open races, forget it, the calculator can only go so high. He has been known to do three events in a weekend. The other amigos have similar records but I think Bobby’s is unique in the sheer number of victories in County, Scottish, British and World Vets Championships. These then are the individuals who made up the team that brought so much kudos to Scotland – and to Clydesdale Harriers. Now for the Championships and the stories behind them. 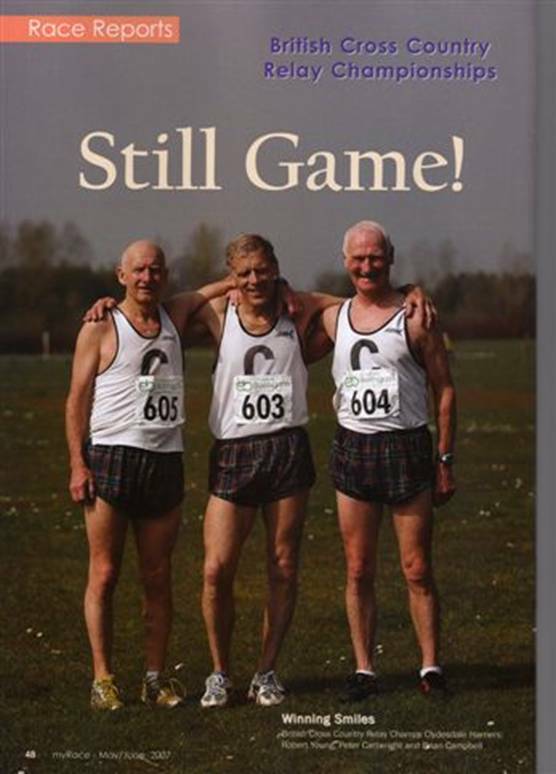 None of them had had a significant running career before becoming vets but all had been medal winners, all had been highly ranked and all had run for Scotland after the age of 40. 13 victories in 17 races at British level is quite a record. The first year as a unit was in 2004 and there was success right from the beginning. The success did not come easily. There might be some notion that because we are talking about the M60 grouping wins were easy to come by but that was most certainly not the case. As in all running, there is always some one or some team that makes life difficult. For our team the main opposition was always Bingley Harriers and in 2007 there was stern opposition from Oxford and then from Elswick. In 2004 they came second in the BMAF Cross Country at Durham Results here are decided by adding the times of the three top runners from each club. Bingley was first with 2:17:36 to Clydesdale’s 2:18:58 – Bobby who had been leading all the way was tangled up among some back markers and misjudged the entry to the finishing straight which allowed Martin Ford of Cheltenham to gain a slight lead which he held to the finish. The team was also third in the BMAF Road Relays at Sutton Park. The trail there seems to suit the Amigos: it starts with an uphill 800 metres, followed by a flat and fast mid section before a long downhill swoop and ending with a punishing, sustained uphill half mile to the finish. This first run was more medals for the team and a personal triumph for Bobby. Pete ran a good first leg after only one week’s training following a long lay off due to injury and finished sixth of the 69 starters in 18:38. Brian who was going well early on tore a muscle running the second stage nevertheless pulled up to fifth in 19:36 before Bobby set off 23 seconds behind the third placed Thames Hares and Hounds runner and eventually caught him on the hard uphill finish to clinch third place by five seconds pulling in a whole two minutes on the leading two runners with the fastest run of the day with his time of 16:58. Team bronze and individual gold were a fair reward for the journey. Bobby’s time is still the only time under 17 minutes for the stage ever recorded. Brian’s calf injury was so severe that it prevented the Amigos competing again as a unit in 2004. If that was impressive, the following year, 2005, turned out to be their best of all with an astonishing six wins in six championships. 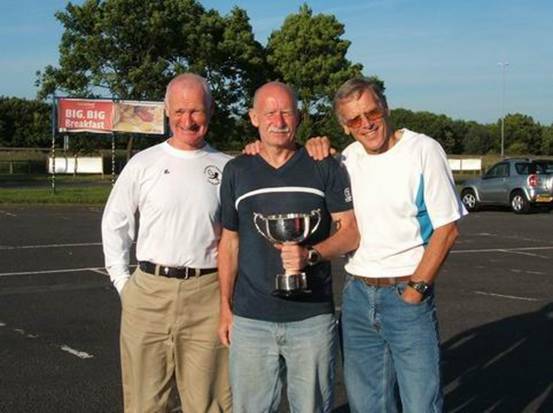 They won the BMAF Cross Country Relays at Norwich from Bingley running in their favoured sequence of Pete, Brian and Bobby on the final stage. Pete returned a time of 16:49, Brian 17:28 and then Bobby ran the second fastest time of the day of 16:23. Gold for the team, silver for Bobby who was only beaten by Les Haynes. At the Cross Country Championship in Bangor, Ireland in March over 90 seconds clear of rivals Bingley Harriers. Bobby in fourth place was clocked at 40:35, Brian at 42:06 was fifth and Pete sixth in 42:10. The National Championships had been held only six days earlier over a testing course in Bellahouston Park and the closeness of the two races meant that Bobby was possibly denied the chance of a British medal. At Sutton Park, they kept the running order established the year before with Pete starting off for the team and being third at the end of a competitive first stage in 17:36 ahead of the two main challengers Bingley Harriers and Aldershot, Farnham & District. Brian put the team into a narrow lead with 17:50 and Bobby opening up the gap to one of 36 seconds in a fine time of 17:09. The team time of 52:35 is still (in 2009) a course record. Bobby added individual gold to team gold once again.
. Later in June at Horwich in the 5K Championship, Bobby was unlucky not to win this one just losing out in a three man tussle up the long finishing hill to be third over 60 in 17:59, Pete fifth in 18:29 and Brian three places back in 18:48. The victory was by 12 points from Bingley. Came September and it was the Road 10K in Glasgow where Bobby again led the team home with 37:51 in bronze medal position followed by Brian in 38:49 and Pete in 39:04. At Bishop Stortford in November for the 10 miles championship the team further enhanced their already considerable reputation over a trail that was mainly off road and went through farmyards, grassy fields and one stretch of about two miles over broken concrete. The finishing order had Bobby in third place after seriously straining a calf muscle on the concrete with 63:32, Brian fifth in 65:55 and Pete sixth in 67:71. There were only (!) four victories for the amigos in 2006. In March the Championships were held in Bournemouth where Bobby was finished in 30:23, Brian in 31:20 and Pete in 32:05. Pete led the team off again at Sutton Park against 39 other club teams and came home neck and neck with Bingley Harriers in 18:41, Brian dropped three seconds to Bingley with a time of 18:13. Bobby had a real ding dong battle with the Bingley top runner and took the club into the lead on the last stage with 17:33 for the narrowest of victories – only two seconds ahead of Bingley. This gave him second fastest time of the day with the fastest being recorded by a man without a team: the single Hallamshire runner turned in a creditable 17:17. However it was another team title. If it was June it had to be Horwich and Bobby was fourth in 18:10, Brian eighth in 19:17 and Pete ninth in 19:18. The 10K Road Race in September was held at Swansea and the team was first in 2 hours 04 minutes and 51 seconds made up of Brian’s 39:45, Bobby who was carrying an injury this time ran 42:22 and Pete came home in 42:44. In 2007 they were first at Horwich with 56:31 to Bingley’s 7:32. Bobby ran 18:41, Pete 18:53 and Brian 18:57 with Bobby picking up bronze for third fastest time of the day. They were first again in the Cross Country Relays at Bathgate where they led from start to finish with Pete clocking 14:57 and handed over a 19 seconds lead, Brian 15:27 to maintain the lead but the chasing bunch pulled in to within 3 seconds but Bobby 14:38 for the fastest time of the day and a 30 second win. Individually Bobby won gold and Pete won bronze. And finally for 2007 they were also second at Sutton Park. Pete ran first and was placed fifth in 18:57, Brian picked up to fourth with 18:16 and Bobby ran an excellent 17:54 on the last stage to be second team and have third fastest leg. Then in 2008 when they were at the very top of the M60 age group with lots of new opposition in the form of young men of 60 and 61 challenging and snapping at their heels they had their last success at Horwich. Pete was quickest this time with 18:47 to Brian’s 19:05 and Bobby’s 19:19. Pete was not only fastest club runner but took gold for the best M65 time of the day. The margin of victory over Bingley this time was 52 seconds. Pete had just turned 65 and it seemed to spark a fine vein of form. 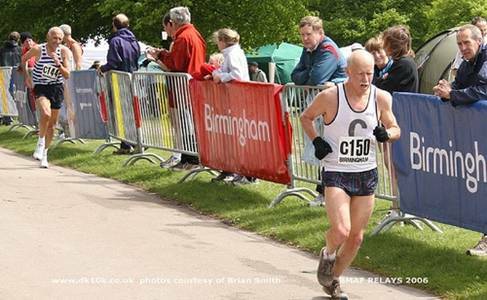 His 18:09 on the first stage of the Road Relays at Sutton Park a couple of weeks earlier was the team’s fastest, Brian was timed at 18:14 and Bobby at 18:13. They followed up with fourth in the Cross Country at Banbury where Pete (now in the M65 class) was again top man in 36:12 and silver medallist, Bobby was three seconds adrift and Brian ran 38:02. “You guys will go 200 miles to get out of a good race: I’ll go 200 miles to get into a good race!” (Ian Stewart talking to some Scottish cross country runners of the 1970’s). The amigos exemplified both of these: they did go where the ‘snow’ (ie the competition) was. They went to all the major championships. The club helped out financially at some points but they had always put their own money where their mouth was and always paid for the travel and entries up front. As for the Ian Stewart line, well they often went further than 200 miles to get into a good race. If runners like everybody else need a challenge to succeed, then they met the challenge and how they succeeded! The record is shown below. It’s not for nothing that the trio is known as ‘The Three Amigos’. They spend a lot of time in each other’s company and this was exemplified in spades when they went off on holiday together at the start of 2009 – no wives, no family, just the three of them. No big deal, you might think, but when you say …’.to Australia and New Zealand for six weeks!’ it is a bit different. The families didn’t mind, they had relatives in both countries so off they went. Bobby tells the story. On 22nd January we flew to Auckland, picked up car and drove south to visit my sister Betty Flynn and brother-in-law Bobby in Taupo where we spent a week. Lake Taupo is a vast flooded caldera of a volcano in the centre of the North Island. A day out climbing Ruapehe, where a volcanic eruption in 1995 interrupted ski-ing , which is a side vent of Ngarahoe which was Mount Doom in Lord of the Rings. Most of New Zealand was in Lord of the Rings. Another day was spent visiting the thermal area of Rotorua and the Maori Hangi (welcome and dance) We also visited Pete’s niece in Nelson on the East coast. Jet boating, white-water rafting and Pete’s bungy jump were also highlights. We travelled down to Wellington, the Capital of New Zealand, a beautiful city set on the hills overlooking the harbour. We stayed two nights fitting in sightseeing, the Botanic Gardens and Te Papa Natural History Museum and a sail in a friend’s boat followed by a barbeque and cold beer. Then it was off early on the Interislander Ferry to Picton on the South Island. This is a fantastic sail across the Cook Strait and down the beautiful Queen Charlotte Sound to Picton. A four-hour drive via Kaikoura took us to Christchurch for a two-night stopover. Christchurch is a very English town, almost like Oxford or Stratford-on Avon, You can go for a punt on their river Avon too. Dunedin is the Scottish town, even got a statue of Rabbie Burns in the Town Square. On next day further south to Te Anau where we had booked a trip to sail on Milford Sound. The bus driver provides an excellent commentary on the geology and history of the area including the construction of the mile-long Homer tunnel through the impassable mountain range to access the fiord area of the southwest corner of New Zealand. The tunnel was built during the depression to occupy the labour force. A sail up the Sound began with an elaborate buffet and continued with frequent pauses to hear explanations of the formations of the rocks and vegetation and the seal colonies was fascinating. The Milford sound is the second wettest place on earth, raining two out of three days of the year (no!, Glasgow’s not the wettest). Actually it did not rain that day but it had the dark, brooding, overcast look that you often get in Glencoe. Mitre Peak rising majestically out of the waters of the fiord was spectacular, the most recognisable sight in New Zealand holiday brochures. A visit to the underwater observatory sunk into the waters of the fiord allows a fascinating view of the life in the fiord. After Te Anau we returned to Queenstown for a three night stay. A trip up Ben Lomond on the gondola to appreciate the stunning view out over Lake Wakatipu with the jagged peaks of the Remarkables in the background and the steamship MVS Earnshaw making it’s way down the lake. In the foreground was Deer Park Heights animal sanctuary which we visited previously. This hill is famous for the Lord of the Ring scenes of the attack by Orcs on way to Helms Deep when Aragon is dragged over the cliff (actually four foot high). An visit to nearby Arrowtown , which is a preserved mining town, a drive down to Glenorchy Forest, where Sean Bean is killed at end of first Rings film and Pete went horse-riding. Before leaving Queenstown Brian went back up the gondola on Ben Lomond and ran off the edge of the mountain- attached to a guy with a parachute- and spent 20 minutes floating over the mountain and lake. Awesome! Next day we left the car at Queenstown airport and flew back to Auckland City in the north of the North Island for a three night stop. Galbraith’s pub and microbrewery next to the hotel proved an irresistible attraction for Brian and Bobby. Auckland is a huge sprawling nearby city which is home to 1.2 million of New Zealand’s 4 million population. Imagine the UK with only 4 million people. Although huge all of Auckland’s citizens live within half hour of the sea, mountain trails and dozens of islands. The Auckland Tower (Sydney Tower is 250m) which is 328m or 1076feet high offers a panoramic view of Auckland . A visit to Kelly Tarlton’s Antarctic Encounter and Underwater world to see the penguin colonies, the sharks and rays in the world’s first underwater tunnels is a must-do experience. Here we also met up again with my sister Betty Flynn, her husband Bob and their daughter Amanda and her husband JP’s family. A three hour flight from Auckland saw us arrive in Brisbane, Queensland, the Sunshine State on the East coast 900miles north of Sydney. Brisbane is a very beautiful city on the banks of the Brisbane River, home to 2 million Australians and third biggest City after Sydney and Melbourne. Brisbane is situated on both sides of the Brisbane river. North is the Central Business District and south is the Cultural, Museums and Art Area with man-made beach. The City Cat fast catamarans provide cheap, fast, easy transport up and down the river, We arranged to visit my two nieces in the suburbs on the same evening as the old firm game. Brian decided to stay in Brisbane in a bar full of Brisbane Celtic Supporters Club members and bond a little. Pete and I kept the appointment but I made it back for kick-off. The result a cagey 1-1 draw but much excitement and beer.. We then set off on a trip to Steve Irwin’s Australia Zoo on the way north up the Sunshine Coast to Noosa where we had booked a day trip to Fraser Island. Fraser Island is the world’s largest sand island at 123km long and 22 kilometres wide and 240m high. Here pure sand supports vast rain forests and there are no roads. We were picked up at our motel in a 4×4 about 6.30am and headed north up 40-mile beach to make the short ferry crossing onto Fraser Island. A drive up the beach, just beating the incoming tide, then inland through the rain forest on bumpy sandy tracks took us to the large, crystal clear Lake McKenzie where we were promised a swim and a barbeque. TV addicts will remember Billy Connelly swimming here in the buff . Unfortunately, although summer, it was raining rather heavily but Brian joined some other hardy souls in a swim before lunch. So next day we drove back to Brisbane for a night then next day drove south to the Gold Coast. High-rise apartments signalled our arrival at Surfers Paradise, with it’s theme parks and nightclubs that attract the young and beautiful, no place for Three Amigos? Unlike the Sunshine Coast and Noosa which is a sleepy place for retired geriatrics. We preferred the Gold Coast, facing the Pacific breakers head on until a tropical storm dropped six inches of rain on our heads in five minutes Having decided to buy five Koala cuddly toys complete with Aussie attire for children/grandchildren of course, Brian with superb bartering skill saved us nearly a dollar. Two nights in Singapore and two nights in Dubai completed a memorable trip.